What is hepatic artery infusion pump placement? This is surgery to place a type of pump into your body. The pump puts chemotherapy medicine into the liver. 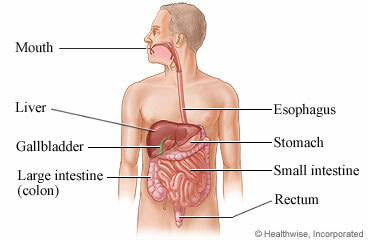 It is used to treat colorectal cancer that has spread to the liver. The pump is a small metal container that holds medicine. A thin, plastic tube called a catheter carries medicine from the pump into a blood vessel. The blood vessel is called the hepatic artery. It goes to your liver. You will be asleep during the surgery. The doctor will make a cut in the right side of your belly near your waist. This cut is called an incision. The doctor will put the pump under your skin. Then her or she will put the catheter into the artery. The doctor will close the incision with stitches. It will leave a scar that will fade with time. Your doctor also may take out your gallbladder. It is connected to the liver by tiny blood vessels. If the gallbladder is not removed, some of the medicine from the pump could get to gallbladder or cause other problems. Your doctor probably will put medicine in your pump at your first follow-up visit. He or she will tell you more about the pump. You will learn how often you need to have it filled. When you no longer need the pump, you will have another surgery to take it out. The surgery will take at least 1 hour. Enter N601 in the search box to learn more about "Hepatic Artery Infusion Pump Placement: Before Your Surgery".